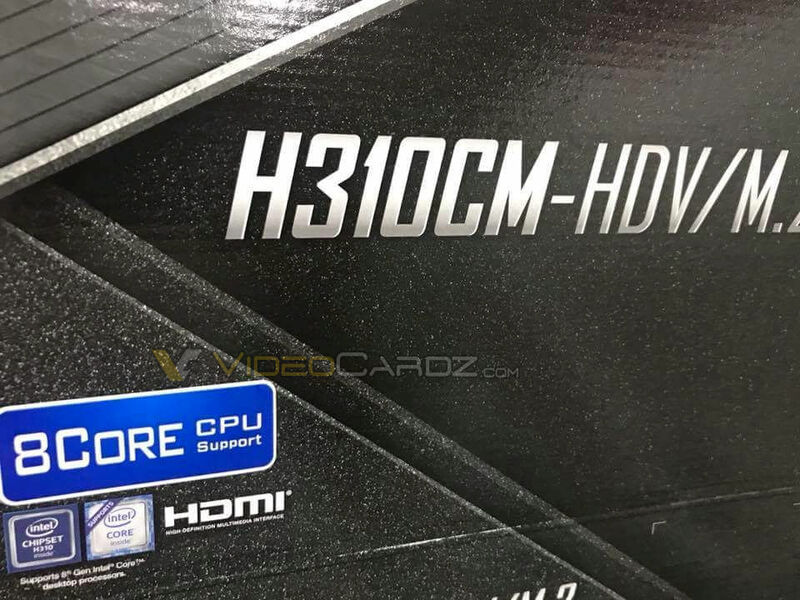 ASRock has started putting stickers on the packaging of its H310 motherboards indicating that the upcoming 8 core Intel CPUs such as the Core i9-9900K and the Core i7-9700K are supported by the H310 chipset as well along with the Z390. Existing H310 boards should be getting a BIOS update that enables support for the new CPUs. We are seeing quite a few details trickle in with respect to Intel's upcoming 'Coffee Lake-S' desktop CPUs. First we saw details leak about the new chips and yesterday, we came to know that only the Core i9 will support Hyperthreading and that the 8 core SKUs will come with a soldered IHS. Now, we come to know that the 8 core Core i9-9900K and the Core i7-9700K will not just be restricted to the Z390 motherboards as was thought earlier. 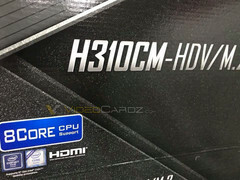 A new motherboard packaging for ASRock's H310 motherboard has leaked that shows support for the new Intel 8 core chips. This confirms two things — one, there are indeed 8 core Intel chips on the anvil and two, a BIOS update can enable the H310 boards support the new CPUs. The H310 offers a low cost entry option for those considering the new 9th generation chips. There are quite a few 300-series chipsets currently available for the 8th generation Coffee Lake-S CPUs including the B360, H370, H310, Z370, and the new Z390. The H300-series is the least expensive of the bunch. Therefore, they do not come with all the bells and whistles of the Z300-series such as overclocking support or high PCIe lane counts. They also have far fewer USB and SATA ports compared to the rest of the lineup. While it is not a bad idea per se to pair the top of the line Core i9-9900K or a Core i7-9700K with the no-frills H310 chipset, it definitely should not be the first preference given the limitations of the chipset. This sort of setup might be favored by someone who'd rather save a few pennies to spend on more important things like the GPU or SSD instead of integrated Wi-Fi, overclocking, or RGB bling. System vendors might also look to market their Core i9 or Core i7-based systems on the H310 chipset to lure customers with a lower entry cost. That said, a Z390 or at least a H370-based motherboard can do a lot more to unleash the full potential of these new CPUs.